After Hurricane Maria hit on Sept. 20, 2017, thousands of Puerto Ricans living below the poverty line were pushed to the brink of despair — struggling for food and housing, diapers and medicine. See photos. NARANJITO, Puerto Rico (AP) — After Hurricane Maria hit on Sept. 20, 2017, thousands of Puerto Ricans living below the poverty line were pushed to the brink of despair — struggling for food and housing, diapers and medicine. 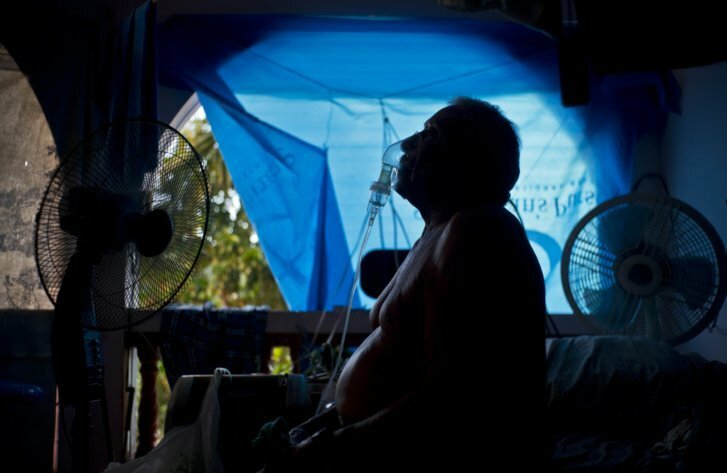 Gilberto Cosme Rodriguez, 73, gets a $320 monthly pension and spends nearly all on the asthma treatments he must take 10 times a day because he has one working lung after the other failed due to what he says was the use of chemicals at a job making construction materials. His home in the northern mountain town of Naranjito is still covered with a blue tarp because Federal Emergency Management Agency assistance did not cover the cost of fixing his roof following the storm. Without more federal aid, or money left over from his pension, he sees no immediate prospect of moving out of the only habitable space in his home, an enclosed balcony still missing windows from Maria. “I start the day like a dead person because of this lung problem,” he said. Alma Morales Rosario, who suffers from diabetes and a blood disease, had taken out a loan to upgrade her home before it was destroyed by the storm, leaving her homeless and in debt. After Maria, Rosario rented a home until she could no longer afford it on her monthly pension of $598. She now splits time between the homes of her mother and her daughter in the central mountain town of Morovis. Rosario said she received $7,000 in FEMA aid, but it ran out, and she is now using money and other help from a relative to try to finish reconstruction of her house. In the northern city of Manati, lines for food and other staples handed out by the MARC Ministry, a nonprofit charity, have doubled in length since Maria. Elia de Jesus Acevedo, 67, was among the hundreds waiting in line for food and other staples from MARC workers this month. She said the home she had rented along with her sister was destroyed by Hurricane Maria, leaving them with nothing. Ramon Alicea Burgos, an 82-year-old retiree, lives in a provisional space made from wood planks and cinderblocks on the former lot of his hurricane-ruined home in the central town of Barranquitas. He partially repaired the home with $14,000 in aid from FEMA, but he says the funds were insufficient due to a surge in the price of building materials after the storm. Burgos lives on $352 a month in welfare and food stamps. A neighbor provides him water, and his makeshift home, which lacks electricity, is lighted at night with a flashlight. Clothes and towels are draped on plastic hangers dangling from the cinderblock walls. Burgos says he’s strong and does not want to go to a retirement home for seniors, adding that his father lived to be 106. A local doctor is helping to collect donations from fellow physicians and patients to help finish the home.